Definition at line 215 of file ms-dtyp.idl. Definition at line 216 of file ms-dtyp.idl. 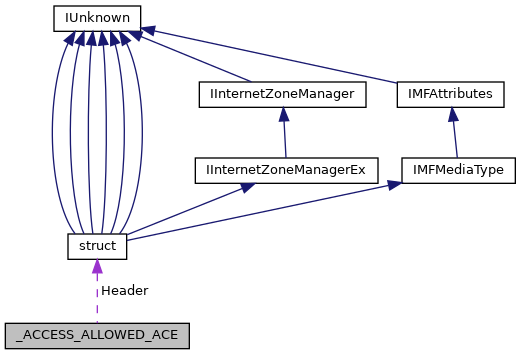 Referenced by DumpAce(), load_default_acl(), ParseStringAclToAcl(), SepPropagateAcl(), and test_AddAce(). Definition at line 217 of file ms-dtyp.idl. Referenced by DumpAce(), load_default_acl(), ParseStringAclToAcl(), SepPropagateAcl(), and VCheckAcl__(). Definition at line 218 of file ms-dtyp.idl. Referenced by DumpAce(), load_default_acl(), ParseStringAclToAcl(), SepPropagateAcl(), test_AddAce(), and VCheckAcl__(). Definition at line 727 of file setypes.h.